How Healthcare Data Analytics is Changing Healthcare Industry? Healthcare data analytics is witnessing an exponential growth as an industry and more than 90% of the payers agree that it is the future. Every person on the planet whose healthcare data is recorded & stored is its potential beneficiary. In the near future, we can foresee an individual specific healthcare treatment plan becoming universal. In this article, we have tried to uncover a few aspects of data analytics in healthcare and elucidated our findings & opinions on how healthcare data analytics is changing the face of the healthcare industry. Imagine yourself in a situation where you require a few sutures, and the procedure is not covered under your current health insurance plan. There can be a few similar scenarios where a simple unwarranted incident leads to accidents, which may not be covered under your insurance plan. Now, what if machine learning can accurately tell you whether the procedure is covered under your insurance plan or not? If yes, then, what will be the cost of the procedure. This will save a significant amount of time and resources, both for you and your physician. Healthcare data analytics can balance out a doctor's time, cost factor, and health coverage. It can help a healthcare receiver to decide which hospital and doctor to consult. As a provider, health analytics will sort a tremendous amount of your manual effort required in doing the administrative work. The ever-increasing claims data and EHR data coupled with the potential of data analytics can improve transparency and provide better care for a specific medical service. The reason being, waste minimization, in terms of time and resources, which is usually concentrated around the planning a service. 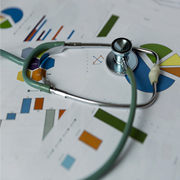 Health analytics give you a perfect figure of price vs. outcome ratio for a specific service. The medical industry is collating a massive amount of data but facing issues in storing and managing those. They either collate the primary & secondary data and do a statistical analysis or leverage the historical data and use analytical tools to draw the patterns. The prime motive, however, should be to use the electronic health records and combine that with the clinical and socioeconomic information and then implement analytics to observe patterns in a particular treatment. Using the healthcare data analytics tools, you can analyze the patient check-up records and can access the public health data to prepare a heat map and pinpoint the desired issues. It can be country or region specific, like population growth, or can be age-wise, like finding the pervasive chronic diseases. Health analytics can also sort out the factors that discourage people from going for treatment. This will allow you to devise a strategy to improve your care in the problematic areas. The recent developments in the healthcare data analytics can help you manipulate, analyze and manage the genomic and health data to implement the genomic medicine. And by utilizing the NGS (Next-generation sequencing) and EHR data, you can ask your vendor to help you with the tools to improve the clinical research and its outcome. Precision medicine initiative leverages the power of data analytics in healthcare, genomics, and healthcare information technology to analyze the data set(s). There are vast investments and research, both government and private,	happening in the precision medicine field. The scope of health analytics is expanding day by day and have emerged as a discipline. It has an invigorating effect on the medical organizations and presents a huge opportunity to make the establishments agile and efficient. According to a recent survey from Ernst & Young, a staggering 91% of the US health organizations have or plan to undertake at least one tech adoption resources in the next twelve months to upgrade their patient experience. How to Leverage Healthcare Data Analytics to Transform Your Healthcare Services? There is a dire need to leverage health analytics to transform the healthcare sector. As a provider, you can collaborate with software vendors who can help you in collating your healthcare data and building analytical solutions around it. Moreover, the healthcare data are stored electronically, which can allow you to use statistical, analytical and mathematical tools to derive at accurate conclusions. The time saved in the manual gathering of data can be used to discover patterns in the data and later on can be leveraged to find the root causes and make changes. Although health analytics cannot substantiate or replace the doctors, it can, however, play an essential role in providing better care. The real concern for the entire provider community is the method of data collection, which sadly, has not been yet systematic. While, there are a few silver linings as well, but far off in New Zealand! One example, which stands above the others, is the country's tactical healthcare management via analytics. The providers, with real-time data at their disposal, are successfully able to reach out to their community and track their patients' health progress. The source of data can be both internal and external. The internal sources will include electronic health records (EHR), clinical decision support systems, CPOE, etc. The external sources can come from the government sources, pharmacies, insurance providers, laboratories, etc. There are several vendors in the market today who offers solutions to cater to your narrow healthcare needs. You should not be drawn towards their haphazard analytical tools or solution. Create a framework for evaluating your needs, and work on creating a roadmap to measure your progress and health data analytics adoption. Healthcare Data Analytics Will Open New Possibilities in Healthcare by providing Tools & Insights to Monitor and Manage Patients' Wellbeing. The impact of data analytics in healthcare will be revolutionary in the coming years, where the physicians can successfully identify any disease outbreaks. With consolidated and precise data at hand, the researchers and pharmaceutical companies can bring their medicine in lesser time. All of these will help the government considerably reduce their healthcare spending. Thus, the future of healthcare in data analytics seems to reinvent the practice of medicine. The healthcare data from both internal and external sources can provide new insights, leading to improvement in patient care and administrative operations. By exploring the process to constantly make data-driven decisions, as a provider, you can do more than endure in the field. You can make a major difference in your patient's wellbeing. At Outsource2india, we have collaborated with experts in the healthcare data analytics and data science domain to provide solutions to our global healthcare clients. Our healthcare professionals have worked in laboratories across the world and our workstations are equipped with the latest technology powered by Big Data, Artificial Intelligence, Deep Learning, and Machine Learning. We can build a personalized dashboard, healthcare data analytics platforms which will allow you to gain a deeper understanding of your patients' well-being and help identify the potential diseases and plan the treatment approach. We can help integrate data from your EHR & EDW and leverage it to build models which will help you achieve the estimated ROI. Get in touch with us for a free assessment and know how we can become your partner of choice in the field of healthcare data analytics.